社名：Tianjin LG Bohai Chemical Co., Ltd.
LG Chem Ltd, the largest chemical company in Korea, announced today that it has expanded its annual PVC (Polyvinyl Chloride) production capacity of its operation in China (Tianjin LG Dagu Chemical Ltd) to 240 thousand tons from its previous 150 thousand. In a global scale, the expansion will allow LG Chem to produce 1 million tons of PVC annually. PVC is a synthetic resin that is fabricated into raincoats, shower curtains, packaging films and intermediates used in industrial materials. Tianjin LG Dagu Chemical Co. Ltd. Paid in Capital : US$ 28.8 Mil. According to the agreement, by taking advantage of rich coal, salt and limestone resources, LG Chem and Tianye will set up a jv to build a proposed 400,000 ton/year carbide based PVC project, with the integration of power, carbide, caustic soda and cement units. The project is hoped to start construction in 2008, but the schedule and financial details are not disclosed. Xinjiang Tianye is a state owned diversified industry Group, whose business covers chemical, plastics, calcium carbide, water reducing equipments農業用散水器具, and food as well as construction. Currently, Tianye has 320,000 ton/year carbide based PVC capacity; it also solely building a 400,000 ton/year PVC project in the same site, which was started construction at the beginning of 2007 and expected to start up in Mid. 2008. The total PVC capacity of Tianye will reach 720,000 ton/year in 2008 and 1.12 million ton/year when the LG-Tianye jv project start up. Tianye and LG really sign an Investment Intent Agreement to build the proposed jv PVC project, but strangely, up to now, there is not any more information about this issue. And the name of proposed jv company is not released yet. Korea's Hanwha Chemical Corp. plans to set up a new PVC plant with an investment of RMB2.66 billion. The proposed plant is selected in Ningbo of Zhejiang province 浙江省寧波 and is designed to produce 300 thousand tons of PVC per year and 300 thousand tons of vinyl chloride monomer (VCM) per year as well as 500 thousand tons of dichloroethylene per year. The plant is subject to approval by the regulating authorities. Hanwha Group has taken the first step in a massive overseas investment plan. Hanwha Chemical Corp. said Monday that it will build a W360 billion (US$1=W938) chemical plant in China to strengthen its core vinyl business and secure future growth engines. The plant, to be located in Ningbo in Zhejiang Province, will start mass production in 2010. Once the Chinese plant begins full operation, the company hopes to achieve annual sales of W300 billion and operating profit of W50 billion in China based on its experience and secure sales network in the country. Hanwha said that markets in the Zhejiang Province area suffer from a lack of supply because output falls far short of the market size. "We will use the project as an opportunity to not only secure our status as the leading polyvinyl chloride maker in China but also grow into a global company by expanding our overseas sales and profits bases," the company said. Taiwan's Formosa Plastics Corp plans to expand its EDC production capacity by 400,000 mt/yr to 1.3-mil mt/yr by the end of 2004 or early 2005 by building a new plant at Mai Liao, a company source said Wednesday. 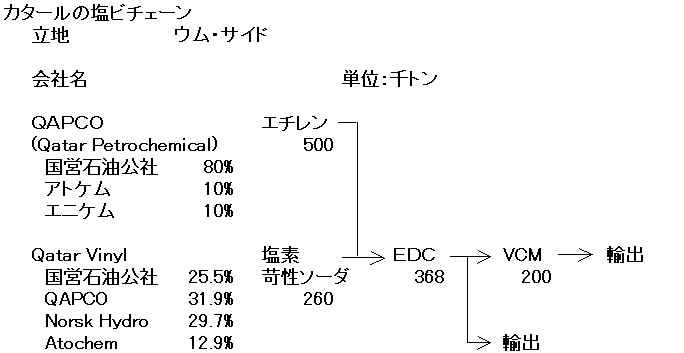 To support the new unit Formosa has ordered an electrolysis plant from Japan's Asahi Kasei that can produce between 300,000 to 330,000 mt/yr of caustic soda and around 280,000 mt/yr of chlorine. Following three decades of experience in Asia, Chao Group entered the U. S. market in 1986 with the acquisition of a polyethylene plant in Sulphur, Louisiana, near Lake Charles. In the ensuing years, Westlake Group has employed a combined strategy for its chemical plants of acquisition, expansion of existing facilities, and new construction. In addition, Westlake Group acquired manufacturing facilities for its vinyls-based fabricated products businesses. In less than 15 years, Westlake Group has become a principal operating interest of Chao Group, encompassing 16 operating facilities in North America. Westlake Monomers Corporation acquired its vinyl chloride monomer (VCM) plant from the B.F. Goodrich Company in 1990. The plant is located within a 300-acre chemical complex in Calvert City, Kentucky, approximately 15 miles east of Paducah on the Tennessee River. It is strategically located to serve downstream polyvinyl chloride facilities located in the Midwest and Northeast United States. Capacity of the plant is 1.1 billion pounds of VCM per year. Our polyvinyl chloride (PVC) resin manufacturing facility in Calvert City, Kentucky is owned and operated by Westlake PVC Corporation. The plant was acquired in 1991 and was formerly operated by Air Products and Chemicals. The Calvert City, PVC plant is located on a 25-acre site. Westlake PVC Corporation benefits from vertical integration as its primary raw material, vinyl chloride monomer, is produced by the Westlake Monomers Corporation plant, approximately one mile away. PVC is the world's second most widely used plastic; only polyethylene is used in greater volume. PVC is produced in powder form, then combined with other ingredients to create a compound with specific processing and end-use properties. PVC is often used in infrastructure development and building products. In this market, Westlake Group is integrated into the manufacturer of pipe through North American Pipe Corporation. Titan's 330,000 tonne/year cracker and 200,000 tonne/year PP unit have recently come onstream. Its 200,000 tonne/year ldPE unit is scheduled for commissioning this month. A Titan source said the PVC oversupply will not hinder the progress of the project. PVC Line # 9 Expansion Project, at our Rayong Factory, shall add up PVC Resin capacity by 120,000 MTPY to the Company's total capacity of PVC production with the project cost of Baht 2,200 million. Expansion Project for PVC pipes & fittings manufacture, downstream industry related to PVC of Nawaplastic Industries Company Limited (NPI) (Subsidiary of TPC by 100% shareholding through Nawaplastic Industries (Saraburi) Company Limited), the expansion is to increase of PVC pipes & fittings manufacturing capacity by 14,800 MTPY and profiles capacity 2,000 MTPY. The Project is now under construction, the completion of which can be expected in 2007. →Solvay 50%+α(TOB), PTT Chemical 24.98%, Charoen Pokphand Group 11.87%. Following the Company’s announcement on the decision to expand the capacity of VCM from 200,000 tons per annum (tpa) to 400,000 tpa and the capacity of Caustic Soda from 133,000 tpa to 266,000 tpa, the construction commenced in the 2nd half of 2005 and all new production lines are expected to be on-stream at the end of 2006. For the additional VCM capacity, the Company will sell 150,000 tpa under a long-term contract with APEX Petrochemical Co., Ltd. (APEX). The Company has a Tolling Agreement with APEX on the production of 48,000 tpa of PVC. The expansion will increase Vinythai’s current PVC capacity of 210,000 tpa to 280,000 tpa. *oxygen from Bangkok Industrial Gas Company Limited. Construction will begin in 2005 with production expected to commence in September 2006. The expansion will double Vinythai's current VCM capacity of 200,000 tons per annum (tpa) to 400,000 tpa. VCM is the major feedstock for PVC production. 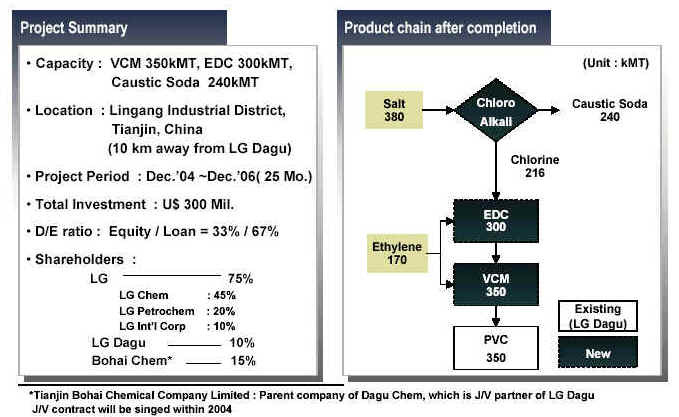 Of the additional VCM capacity, the Company will sell 150,000 tpa under a long-term contract with a local producer of PVC, APEX Petrochemical Co., Ltd. (APEX) who currently imports VCM for its own PVC production. The remaining 50,000 tpa will be exported or sold domestically. The Company also has a tolling agreement with APEX on the production of 48,000 tpa of PVC. A relevant MOU has been signed between VNT and APEX. Japan's Mitsui & Co may pull out of its Vinyl Chloride Monomer (Malaysia) joint venture with Petronas. A Mitsui source said the company was in serious discussions with its Malaysian partner on whether it should withdraw from their joint venture or carry on. Mitsui has a 40% stake in the venture, which operates a 400 000 tonne/year VCM plant and a 150 000 tonne/year polyvinyl chloride (PVC) plant in Kerteh, Malaysia. Vinythai PCL plans to invest US$ 3.4 million to increase its production capacity of vinyl chloride monomer, in an attempt to ease a bottleneck in its production of polyvinyl chloride, the company's Vice President for Finance Santisuk Sangrungruang said. The efficiency improvement plan will increase the company's production capacity of VCM, the feedstock used to make PVC, to 200,000 metric tons per year from the current 187,000 tons per year, says the report. The capacity expansion at Vinythai, the country's second biggest PVC producer, will begin next year and will be completed one year later. The company's PVC production capacity will then increase to 175,000 tons per year from the current 164,000 tons per year. 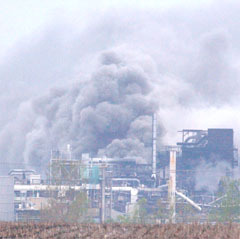 Smoke billows from the Formosa Plastic plant Saturday in Illiopolis, Ill. The handful of workers who had staffed a closed plastics plant near Illiopolis since a fatal 2004 explosion are no longer on the job, local leaders and former employees say. Now local officials doubt the owner, New Jersey-based Formosa Plastics Corp. U.S.A., will be back. LG Chem Ltd., the largest chemical company in Korea, announced today that it has signed an expanded term EDC (Ethylene Di-Chloride) supply agreement with U.S. OxyChem, one of the world's largest merchant suppliers of EDC. The signing ceremony took place in Dallas, Texas. Through this strategic alliance, LG Chem's annual PVC capacity is expected to rise to 2.05 million tones (Korea 0.95 mil, China 1.1 mil) by 2010, which will elevate LG Chem to the position of the 3rd largest PVC producer in the global market. Address : 111/1 Mu 2 Nikompattana, King Amphur Nikompattana, Rayong 21180 Thailand. Formosa is planning to build a 180,000 mt/yr polyvinyl chloride plant in Texas, a company source confirmed Friday. Projected cost is $1.1-bil, which includes a 300 MW power plant at the same site. Teknor Apex Company today acquired Singapore Polymer Corporation (Pte) Ltd., a diversified thermoplastics compounder with a nominal capacity of 70,000 metric tons (155,000,000 lb.). The transaction involved the purchase of shares in Singapore Polymer Corp. from Oslo-based Norsk Hydro ASA and the Development Bank of Singapore. Singapore Polymer Corp. manufactures flexible and rigid vinyl, thermoplastic elastomers (TPEs), polyolefin and styrenic compounds, and color and additive masterbatches. Teknor Apex Company is now carrying out startup procedures for a plant in Suzhou, China that will produce compounds that comply with international standards for the appliance, automotive, building, electronics, medical device, wire and cable, and other markets, it was reported today by Singapore Polymer Corporation (SPC), a Teknor Apex Company. SPC will formally announce the opening of the plant at Chinaplas 2007 (Stand 2D115). Operating the plant will be a new company, Teknor Apex (Suzhou) Advanced Polymer Compounds Co. Pte. Ltd.. The plant will have the capability to manufacture rigid and flexible vinyl and thermoplastic elastomer (TPE) products like those developed in the U.S.A. by Teknor Apex and in Singapore by SPC; engineering thermoplastics (ETPs) produced in the UK and U.S.A. by Chem Polymer (also a Teknor Apex company); and other specialty compounds developed by SPC. The agreement grants Teknor Apex exclusive worldwide rights to manufacture and market products based on Cerestech’s patented technology and to sub-license use of the blending process. The technology involves preparing relatively low-cost thermoplastic starch (TPS) from starch granules and then combining it as a masterbatch with bioplastics like polylactic acid (PLA) or polyhydroxyalkanoates (PHA), or with petrochemical-based polymers such as polyethylene. The Cerestech process is based on patented technology developed by Dr. Basil Favis, who founded Cerestech Inc. as a spinoff company from the Ecole Polytechnique de Montreal. The technology makes it possible to combine other polymers with TPS from vegetable sources like corn, wheat, or potato while achieving better performance properties than are typical for conventional starch-containing blends, said Dr. John Andries, Teknor Apex senior vice president of technology. (1) 子会社の商号：Mitsui VCM Holdings (Malaysia) Sdn. Bhd. Solvay today announces that in line with its strategy of growing in emerging markets, its Dutch subsidiary Solvay Chemicals and Plastics Holding B.V. is launching a tender offer on the shares of Vinythai, the Thai Vinyl and Chlor-alkali producer. Solvay’s participation in Vinythai recently has crossed the threshold of 50% of the shares of its Thai subsidiary. The tender offer price is 6.15 Thai Baht per share, and the offer period will run from December 16th 2009 to January 21st 2010. Solvay has no intention to increase the price or to extend the term of the Tender Offer. The offer will allow Solvay to support the development of Vinythai’s businesses, including the Epicerol (R) project recently transferred to Vinythai. Epicerol is an innovative and environment friendly production process for epichlorohydrin, protected by 38 patent applications, some of them already granted in different parts of the World. It is based on the transformation of natural glycerine mainly obtained as by-product from the production of biofuels. Epichlorohydrin is an essential feedstock for the production of epoxy resins, increasingly used in applications such as corrosion protection coatings as well in the electronics, automotive or aerospace industry. Demand for epichlorohydrin to produce wind turbine blades of windmills is also soaring. VINYTHAI is a Vinyl and Chlor-alkali producer listed on the Stock Exchange of Thailand. Its major shareholders are the Solvay Group (50%), PTT Chemical Public Company (24.98%), and the Charoen Pokphand Group (11.87%). In 2008 Vinythai recorded total revenues of 13,312 MTHB (EUR 275 million) and booked a net profit of 1,035 MTHB (EUR 21 million). Vinythai employs 390 people. A year ago Vinythai increased its PVC capacity at Map Ta Phut in Thailand by 70,000 tonnes to 280,000 tonnes, and has a plan to raise capacity in stages to 400,000 tonnes. The site is also home to the 100,000 tonnes glycerine-to-epichlorohydrin Epicerol process plant being built by Solvay, and due to be operational about now. The Epicerol process makes epichlorohydrin from the glycerine by-product of biodiesel production. Epichlorohydrin is a feedstock for the production of epoxy resins and Solvay says demand for it has significantly outpaced the growth of the world economy in recent years.